I didn't intend to take so long to post swatches of these... What I really wanted to do was post a bunch of looks using these colors, but I've been in such a creative rut lately... I haven't been able to think of any cool combinations! D'oh. 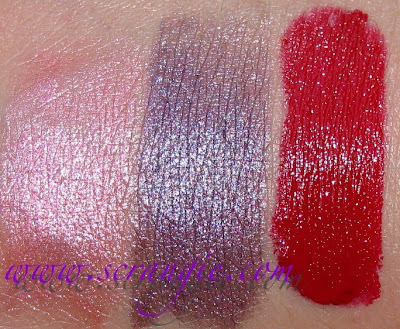 But here are some swatches from Evil Shades- a company owned by a fellow blogger- EvilAngel from Black Nail Polish and Lipgloss! Some of the darker shades, indoors and in sunlight. Devil's Bonfire, Necropolis, Acolyte, Double Barrel, Abyss, Zombie, Souls Torment, Mordant. Some of the colorful shades, indoors and in sunlight. As always, you can click the images to enlarge and view more detail. So now that you've seen some examples of the types of fun colors she sells, I bet you're wondering about the formula..... And I'm pleased to say that it's really nice! I haven't used all of the shades for full looks yet but I have used about half of them on the eyes and I am pretty impressed. They're really smooth and pigmented. I normally have to use mineral-type shadows wet in order to achieve decent opacity and pigmentation but these were pretty good on their own. Even better wet. All of the colors have something special to them- they didn't look very vibrant in the plastic sample bags but once you put them on your skin they pop- some have secret colored shimmer, some have glitter (holo glitter too! ), some have a faint reflective sheen to them. The lipsticks were fantastic. I normally don't wear lipstick because it's drying and these aren't. These are almost a balm, but super crazy pigmentation. Devilista was like WHOA- amazing coverage and POW! color. You will want to use a lip brush with that one, color like that needs a precision application! 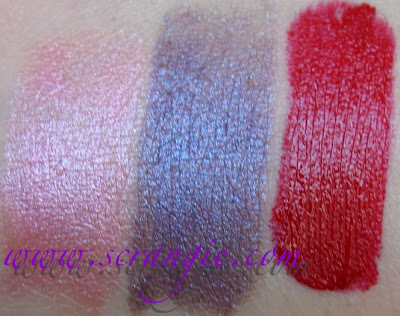 Corruption is my favorite and I wear it pretty often now- a soft silvery-grey-purple shade with a little blue shimmer. Primrose Path is rather demure but works nicely to balance a dark and dramatic eye. On top of the great pigmentation and creamy formula, they smell nice. Really nice. I don't know exactly like what, but it's sweet and pleasant. I'm super into my lip products being scented- I've been known to not buy lip products because they were unscented- and I'm quite happy that these have a nice sweet scent to them! Makes them a little more fun. There were a few things I didn't like. They are purely my personal preference and are not flaws with the product itself, but I felt I should give my honest opinion. My main disappointment is with the packaging. It's very plain and a bit home-made looking. One one hand it adds to the charm and indie feeling, but on the other hand it seems a bit unprofessional. It is purely aesthetic- the product inside is great! But the little bags and plain black lip balm tubes with slightly off-center stickers don't seem to reflect what's inside. I do understand that it's only packaging and that it may not be feasible financially or time-wise for a one-woman-business to have custom labels and packaging for all their products. The other thing that I didn't quite enjoy was that the samples come in bags. Again, this is my own personal preference and doesn't reflect the quality of the product. Some people love bag samples because they're less expensive and easier to store. I find them messy to use. For one, it's hard to get the pigment onto the brush because it's all settled onto the sides of the bag and I usually get my fingers a little dirty cause it ends up on the sides of the brush. Another reason why I prefer jars over bags is that I can't use the pigments wet when they're in a bag like I can when they're in a jar. In a jar I can put some mixing medium on the lid and mix a little of the shadow into it. And one other reason I don't like bag samples is that they don't make the colors look nice! Some of the shimmer tends to stick to the bag while some of the more colorful or pigmented parts in the shadow sink to the bottom, giving the illusion that it's a plain frosty shimmer... Only when you open the bag and touch the shadow do you see the true color. I can see why the packaging would be this way- it keeps costs down! Makes it more accessible. No one likes to pay more for a fancy package, it's what's inside that counts! Except... I totally would pay more for a fancy package, it's part of the fun of makeup for me. But, that's just me. 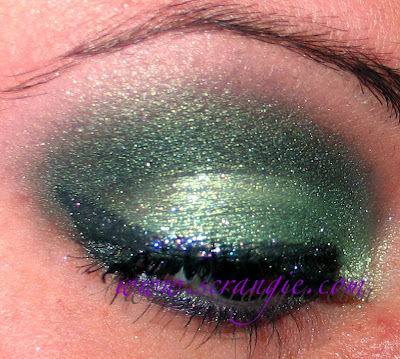 I don't remember everything I used for this look, but I do know that I used Acolyte and Devil's Bonfire mixed together in the crease. I think the lid color may have been Fyrinnae Electric Stardust. 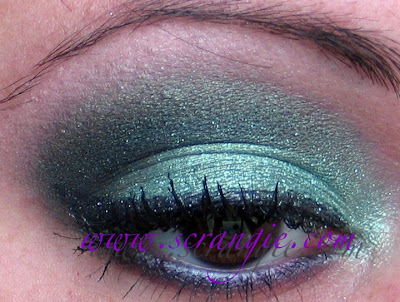 You can see how nice and sparkly and rich the crease color looks- that's not even used wet! Hopefully I'll find some creativity and get over my makeup block (kinda like writer's block?) so I can post some better looks using these! Wow! Great pigmentation. The eye look you did is very pretty. Great shades! Necropolis is my favorite from the first photo and I can't decide for the other photo. =D Great eye make up as well. The green shade is awesome! I <3 Evil Shades. 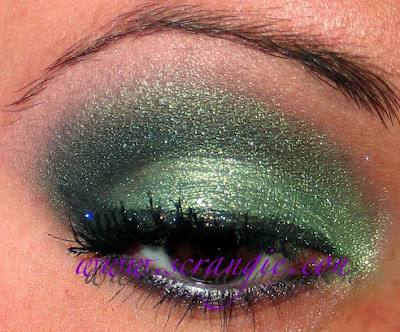 OMG I love your Green eyeshadow look. Just Great. Absolutly perfect timing....I just switched my samples over to clamshell jars! Great minds ya know! hehe Oh and also I have been changing labels over to pretty , a little fancier looking styles. My baby is growing to a point where I can dress her up to match her lovely "personality"! great review! i love evil shades :) her lipgloss and cuticle balm is fab too! OMG..the green shadow is awesome..you have done a great job with this shade...lovely. i absolutely love those lipstick colours, especially the second one. Yay for Evil Shades! I love the products. I know that Andrea is always receptive to feedback and takes a lot of personal care with all of her makeup. I am a loyal customer, and your swatches of course make me want more. EVIL SHADES LIPSTICK TASTES LIKE SWEET TARTS! YUM! My lipstick came in a white lipbalm stick but the colour inside was a wicked green and the smooth moisture-rich texture was dreamy and the colour is WHAM-POW!! Amazing. I would never buy from that lady because she is a scam artist. I'd rather spend my money on some really nice Urban Decay or MAC. That way you know you're not giving your money to a stalker. I <3 the shades and I <3<3<3 Andrea! Fantastic!! Gorgeous look and I love the swatches. Necropolis and Mordant look beautiful! These looked so fantastic that I went to the website right away and purchased a few products. 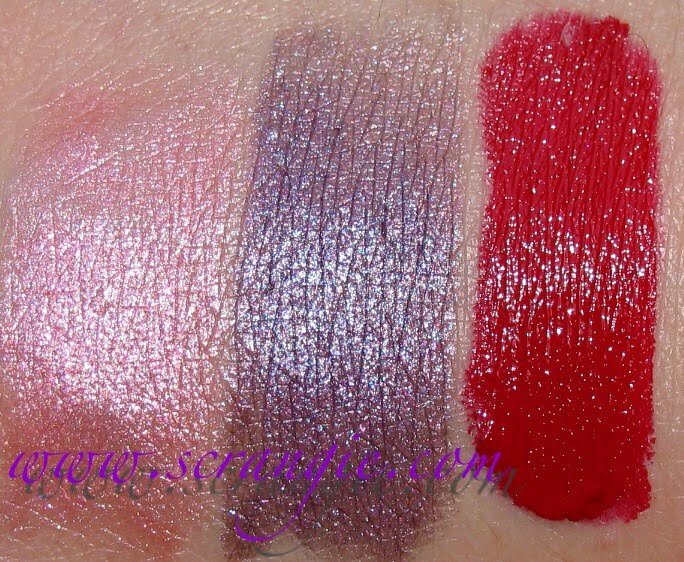 I ordered the Necropolis, Acolyte, Double Barrel, and Zombie eyeshadows thanks to your pictures, Scrangie. I'm a total sucker for dark, earthy toned shadows. 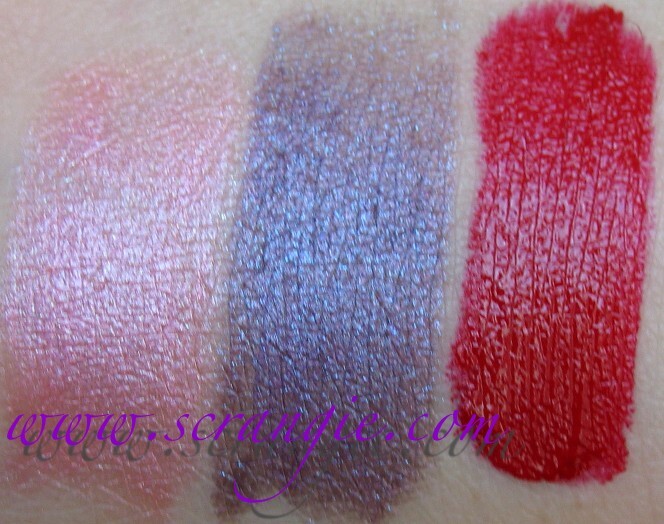 I also got the Venom eyeshadow and a pot of Wicked Gloss in Lethal Kiss. Thanks for these great pictures and such an informative review.